Greetings and Salutations, the 3 Kittens blog is back due to popular demand… okay, it was mainly Missy Ridley’s idea, but we think it is a grand idea! Janine and Cecilia will be taking it over. We will be both writing alone and together. I am Cecilia (Janine’s witty and sassy sidekick). I am sure you all know Janine the Great and Powerful. If not, come by any day but Friday and she is here, slaving away over hot yarn! So to kick off the re-launch, I am going to discuss some new yarns we have in house. We just received in some new colors of Schaefer Susan (100% mercerized pima cotton): Beatrix Potter, Wilma Rudolf, Laura Ingalls Wilder, Shari Lewis, Frieda Kahlo, and Ruth St. Denis. They are all fabulous and great for summer knitting! 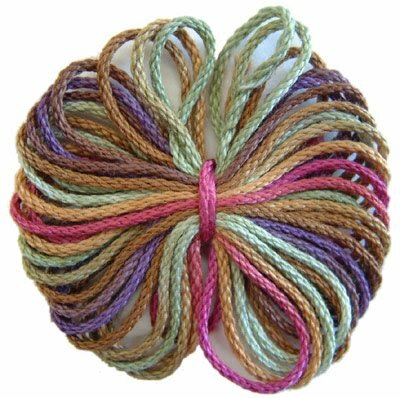 We also received in a bunch of Schaffer Anne (a lovely merino sock yarn). We have decided to start carrying Knitscene again. The latest edition (the special Easy edition) is in the store. There are several fantastic patterns that would be great for gifts. Is it ever to early to think about Holiday knitting? I don’t think so! Also, come in and check out all of our new summer yarns. I am just going to mention a few here: Punta’s Montoya (this is the same linen that Eileen Fisher uses! ), Berroco Weekend (an acrylic/cotton blend) and K1C2 Ty-Dy Dots (a cotton yarn that coordinates with Ty-Dy). There are many more, much too many to mention here. Please stop by and get ready for all of your summer knitting. TNNA (our retail market) is just around the corner. Janine and Laura will be heading down to Columbus, OH in just a few weeks. They will be checking out all the fall yarns, patterns, gadgets and canvases and much more. We will have a full report in mid-June. If there is something you would like them to look at while they are out there, please leave a comment. On the Needlepoint side, we currently have a Petei trunk show in house. It is only here until Sunday May 23rd. Hurry in and give them a look-see…Also, watch for details on a CBK Featured Artist trunk show. There are a variety of new canvases from a beautiful Geisha, to a Fire God Kabuki mask and an angry cardinal. 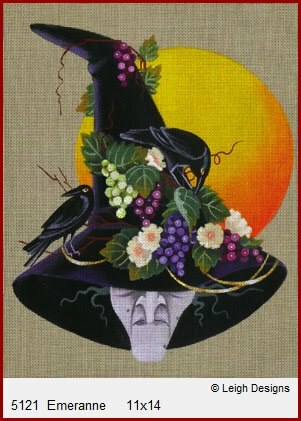 Also new from Leigh Designs are spooky adorned witches. They are amazing! We also got in some new ornaments, choose from presents or shoes. Don’t forget to check us out on Ravelry and Twitter (put us on your list). Next > >Good Glorious Saturday Morning!!! >Yahoo!! Welcome back.That witch is fabulous! !